No artistic results can be obtained by buying fittings haphazardly or without the advice of some expert who has seen and carefully considered the possibilities of the rooms to be lighted. One great axiom of artistic lighting is that one should not be able to perceive immediately how it is done. On entering a well-lighted room one should have first a pleasant impression of diffused light. Lighting, however, cannot be really artistic unless it is becoming to and is suitable to the purpose of the room. A soft-shaded light is beautiful in a reception-room, but out of place in a living-room, where work has to be done, or in a bedroom, where hair-dressing or shaving require strong light. In a reception-room the light should be bright and clear, but not garish or dazzling. A room of this kind should be evenly lighted, so that hard or unbecoming shadows are avoided. To obtain this result lights must be placed round the room in such a position that the brightness does not strike the eyes direct, but shines on to ceilings, walls, or mirrors, and is reflected back into the room. This can be done by setting small electric bulbs behind the cornice. A large number of bulbs are required for the scheme, as not more than three-quarters of the light is reflected back again. This expense, however, is counterbalanced by the saving in fittings. If the cornice is not deep enough to hold the bulbs, reflecting fittings may be suspended from the ceiling. 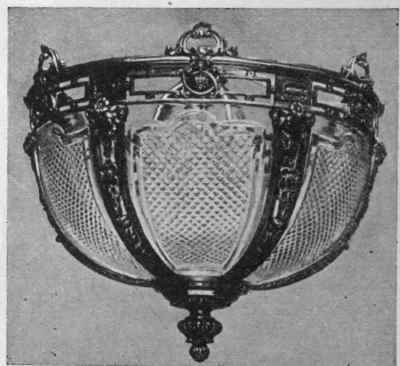 These consist of a group of lights, under which is a kind of deep bowl of cut glass, coloured silk, or pierced metal. This bowl allows only a very little light to fall downwards, but throws most of it up on to the ceiling, and so diffuses it about the room. The lights themselves can be either electric or incandescent, and a very pretty result can be obtained from the use of an oil-lamp with reflecting fitting. When oil or gas is used the light must not be hung too near the ceiling, and if it is to reflect and diffuse properly the ceiling must be white, cream, or a light blue-grey. Wall brackets or sconces should be fitted with butterfly shades, which throw the light back on to the walls, from whence it is reflected to the room. For conversational purposes a low, shaded light is more artistic, and nothing gives a more beautiful effect than standard or table lamps fitted for incandescent gas or electric light. Any kind of standard lamp can be fitted with an incandescent burner, and can be moved about with almost as much freedom as an electric lamp. For the ordinary drawing-room it is a good thing to have a combination of the two kinds of lighting. Cornice or wall lights, which can be used when brightness is wanted, and well-shaded lamps when cosiness is required. The success of lighting depends largely upon the colour of the shades chosen. A most becoming effect can be obtained from deep yellow or rose-pink - really deep, warm colours. Pale yellow simply looks a dirty white when the light is on, and very pale pink gives a trying glare. Pink shades look beautiful in a grey room, yellow shades in a green room. Red shades should be used in a dark room with pannelled walls, or dark red or brown paper. Anyone who wants a "pink" room or a "yellow" room will find that a much prettier effect can be got by having white or cream walls, and pink or yellow shades, rather than by decorating the walls with coloured paper. Artistic effects can be obtained by the use of coloured glass bulbs, such as are used in exhibitions and open-air decorations. This is quite a new idea in house-lighting. Most people buy the ordinary white bulbs and cover them with little silk bags, or surround them with silken flower-petals. If a deep pink bulb be chosen and partly covered with a pink silk petal shade, the light looks exactly like a big glowing rose. A deep yellow bulb may be shaded with green silk petals, giving the effect of a large glowing buttercup. Devotees of the "good old days" say there is "nothing like candle-light." But, however beautiful and mellow this light may be, it is hardly practical for modern use. 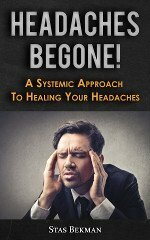 The same effect, however, can be obtained from gas or electricity. Porcelain candles can be fitted with very small incandescent mantles or electric bulbs, and, when the direct rays are broken by shades of beads or silk, the effect is as soft and pretty as that of candles or oil-lamps. Owners of old-world houses should remember this when planning their lighting, for the charm of old-fashioned rooms in the evening depends upon the use of the quaint pendants and sconces which harmonise with and are part of the decorations. Queer old lamps and antique candelabra, handsome Sheffield plate and valuable lustre candlesticks, or any other kind of fitting, can now be used with gas or electric light. 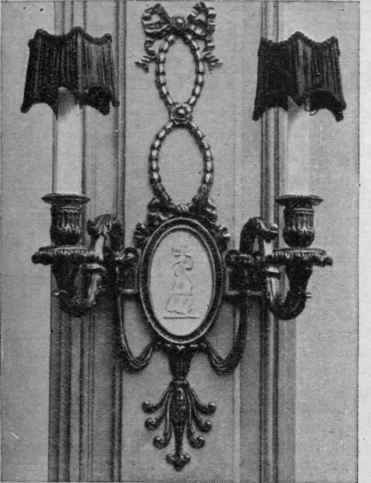 Old Sheffield plate candlesticks fitted in this way form the ideal method of lighting a dining-room. If a hanging light is used over a dining-table, the top of the fitting should be covered in, so that the light is thrown on the table and reflected back from the linen and silver or the polished wood of the bare table. Great care should be taken that this light is pulled down low enough to prevent any of the rays striking directly into the eyes of those sitting at the table. Small electric-light bulbs can be introduced among the dinner-table decorations, and produce most charming results. A bank of moss in the centre of a table becomes a mass of delicate green and gold light if hidden among it are a few electric bulbs. There are two or three ways of fixing up the electric light on a dinner-table. The easiest is to use ordinary table-lamps with long wires and attach them to a plug. 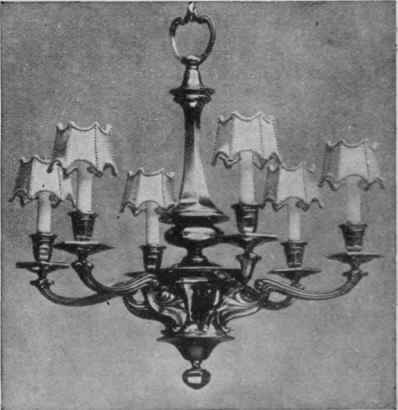 Another way is for the table-lamp to be connected to the fitting which hangs from the ceiling. Still another way is to have an electric plug in the floor under the dining-table, and connect this by wire with an electric plate or cloth, which is placed underneath the damask cloth. The electric fittings, lamps, candlesticks, or candelabra have two little pins underneath, and when the fittings are placed on the table, their pins connect them up with the electric plate or cloth. A small hole has to be cut in the carpet, and is generally edged with a brass ring to form an eyelet-hole round the floor-plug. Illustrations are kindly lent by Best and Lloyd, of Birmingham and London.